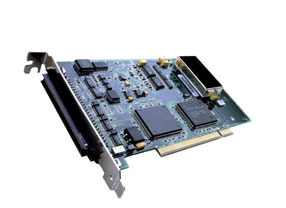 The OMB-DAQBOARD-2000 Series sets the price/performance benchmark for high-speed, multi-function plug-and-play data acquisition for PCI bus computers. The hardware design offers all of the features normally found on significantly more expensive boards, including 16-bit, 200 kHz A/D, 100% digital calibration, bus mastering, two or four 16-bit, 100 kHz D/A converters, 40 digital I/O lines, four counters and two timers. The OMB-DAQBOARD-2000 Series is supported by a growing family of over 30 signal conditioning and expansion options, offering signal conditioning for thermocouples, RTDs, accelerometers, isolation, high-voltage, strain gages, and much more. Up to 528 channels of analog and digital I/O can be accessed using one OMB-DAQBOARD-2000, while maintaining the 5 µs per channel update rate. Up to four OMB-DAQBOARD-2000s can be installed into one PC. Software support is the most extensive of any board, including comprehensive drivers for nearly every programming environment under Windows XP and higher. Included in this list are Visual Basic, C++, Delphi, TestPoint, LabVIEW, and DASYLab, and C++ for Linux. Also included is a suite of DaqView software options for setup, acquisition, display, and analysis of acquired data—no programming required. The OMB-DAQBOARD-2000 Series sets a new standard with its ability to make analog measurements, read digital inputs, and read counter inputs, while synchronously generating up to four analog outputs and/or a 16-bit digital pattern output. Most other boards require CPU interaction to access I/O other than analog input, making it impossible to generate time-critical analog waveforms or digital patterns. With the new OMB-DAQBOARD-2000 Series, the true power of today's PCI-based PCs can be unleashed. The same synchronous features of the OMB-DAQBOARD-2000 extend to its family of OMB-DBK signal conditioning and expansion options. Up to 256 analog input channels and 272 (P2 only) digital I/O channels can also be accessed synchronously to one another, with precise and deterministic channel-to- channel timing. Up to four OMB-DAQBOARD-2000s can be installed in one PC, quadrupling the channel capacity to over 1000 analog input channels, 1000 digital I/O channels and 16 high-speed analog output channels. Signal I/O One 100-pin connector on the OMB-DAQBOARD-2000 Series provides access to all of the input and output signals. Unlike other multifunction boards that require multiple PC slots, the OMB-DAQBOARD-2000 Series accommodates all I/O using one cable and utilizes only a single PCI slot. The 100-pin OMB-DAQBOARD/2000 Series I/O connector, P4, is logically divided into three sub-ports, P1, P2, and P3. P1, the analog input port, contains all of the analog input channels, as well as the sequencer control signals for accessing external analog input options. All analog expansion options attach to the P1 port. P2, the general purpose digital I/O port, can be used directly to control and monitor 24 digital I/O lines. P2 can also function as the digital I/O expansion port, whereby the 24 lines are exclusively used to control external digital OMB-DBK expansion options, for up to 256 lines of digital input or output. P3 contains an additional 16-bit digital I/O port, as well as the counter inputs, timer outputs, and analog outputs. Several options are available to provide easy user access to all of the I/O signals on P4. Analog Input (P1) The OMB-DAQBOARD-2000 Series has a 16-bit, 200 kHz A/D coupled with 16 single-ended, or 8 differential analog inputs. Thirteen software programmable ranges provide inputs from ±10 V to ±156 mV full scale. Each channel can be software configured for a different range, as well as for single-ended or differential, and unipolar or bipolar input. Beyond the 16 built-in analog inputs, the user can expand the OMB-DAQBOARD-2000 Series up to 256 analog inputs using external OMB-DBK signal conditioning and expansion options. As with the on-board channels, expansion channels are scanned at the same 5 µs/channel rate (200 kHz), and most are software-programmable for range. There is no speed penalty for scanning expansion channels versus built-in channels. The OMB-DBK expansion options offer a wide variety of signal measurements, including thermocouples, RTDs, strain gages, accelerometers, high voltage, isolation, current, and much more. See the Related Links section at the bottom of this page for more details on the expansion panels. 참고: All OMB-DAQBOARD-2000s include a CD ROM with all documentation including operator’s manual, DaqView Windows Software, DAQX API library for Windows XP/Vista/7 for C++, Visual Basic and Delphi and drivers for LabView, TestPoint and DasyLab.